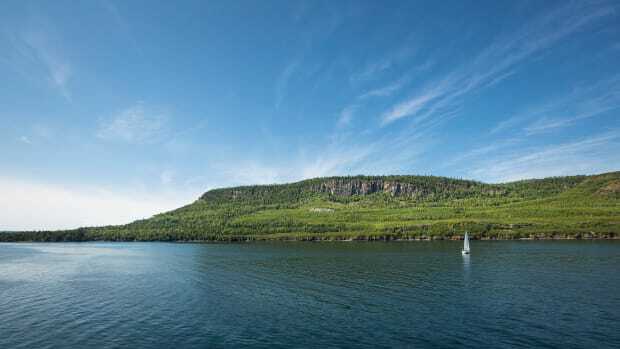 The northern reaches of Lake Huron, from the Mackinac Bridge to Drummond Island, boast some of the finest cruising grounds in the Great Lakes. The expansive bridge over the Straits of Mackinac connects mainland Michigan with its Upper Peninsula where boaters find a plethora of small towns and islands settled along broad, sandy beaches and lush, tree-lined shores. 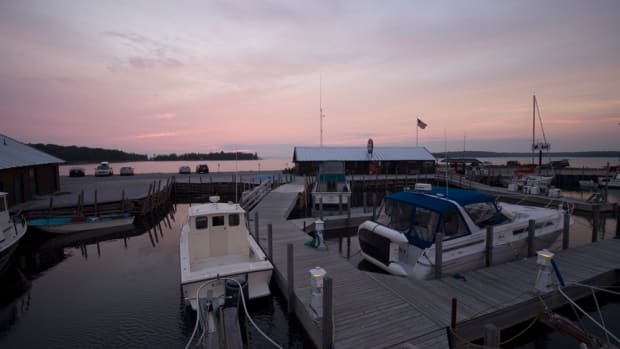 Michigan’s extensive marina system offers plenty of dockage for visiting cruisers and you’ll find anchorages in Les Cheneaux Islands (called “the Snows” by locals) for those who prefer to venture a bit off the beaten path. Whether the northern part of the lake is your destination or you’re passing through the area on your way to the North Channel, you have plenty of places to stop and enjoy the crystal-clear cruising waters. Over the years we’ve traversed this area, first sailing in the Chicago-to-Mackinac races, later cruising to the North Channel, and then doing the Great Loop cruise on a trawler. While distances are relatively short between harbors and anchorages, these are big, wide waters known to be temperamental. For the most comfortable passage, choose settled weather conditions and allow layover days for poor weather. 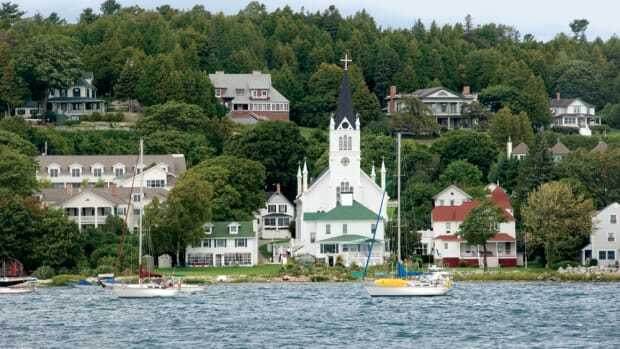 You won’t regret being weathered-in when visiting the likes of Mackinaw City on the mainland, Mackinac Island, or St. Ignace in the Upper Peninsula, so waiting out formidable weather is a prudent choice. 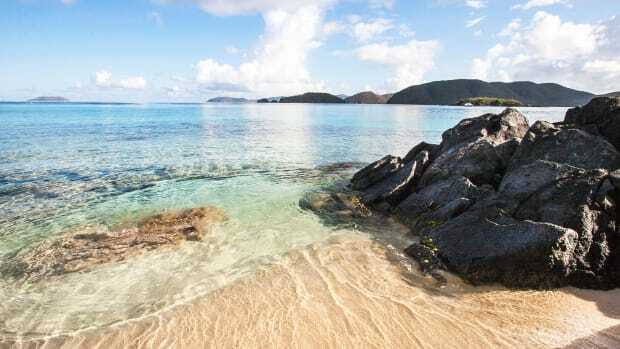 What follows is a cruise planner for the area based on our most recent visit with suggestions for navigating these waters and places to explore. This part of northern Michigan is a popular vacation spot, so expect to be part of a crowd when you visit places like Mackinac Island, but don’t be surprised if you have a protected anchorage all to yourself in the Snows. This town is the main port of departure to Mackinac Island from the Michigan mainland, so expect to see heavy ferry traffic to and from the harbor. The city is located at the base of the Mackinac Bridge. It’s easy to spot with both the commercial and yacht harbors on the east side. Ferry traffic in and out of the harbor is constant, with one ferry service using the north harbor basin, and the other, the south. 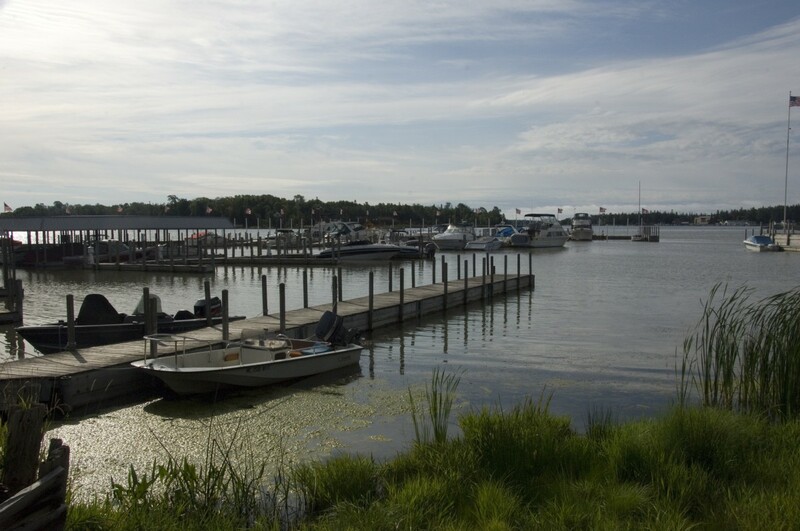 Adjacent to the ferry terminals are two competing marinas at the foot of the harbor. On the north side of the harbor is the Mackinaw City Municipal Marina with a well-stocked ship’s store; just south of it in another basin is the newer Mackinaw City-Straits State Harbor Marina, with floating docks. Across the street is Central Street, the main drag with many stores, restaurants, and a mini-mall called Mackinaw Crossings. Within a short walk you’ll find a fish market, bookstore, bakery, coffee shops, and various specialty shops. For provisioning there’s a well-stocked IGA grocery store up the street, and store employees will give boaters a ride back to their marina with their provisions. To learn about the city’s history, take a trolley tour of the area or bike to the Old Mackinac Point Lighthouse for a glimpse of the bridge. A waterfront park and trailhead offer miles of hiking and biking opportunities. At 14 miles east of Mackinaw City and 15 miles southwest of Mackinac Island sits Cheboygan. The approach is straightforward; the outer buoy R2 is about a half mile northwest from the breakwater entrance. There is an easy-to-spot white lighthouse on the east side of the entrance. 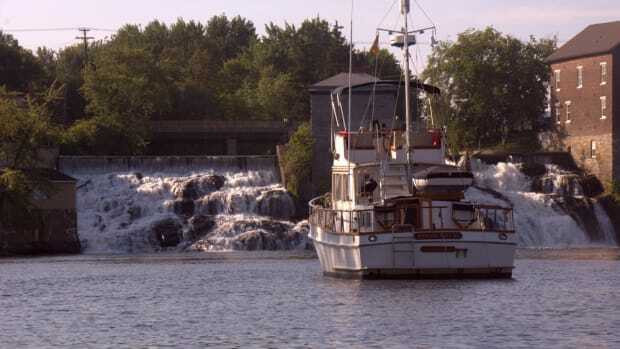 A short way up the Cheboygan River you will find Cheboygan County Marina on the starboard side of the channel. There is a nearby park and beach that make it a popular stop for a cruising family with kids who need a jungle gym to climb. It’s about a half-mile walk from there to the center of town. More facilities are farther up river at Walstrom Marina in town and municipal docks with 30-amp power beyond the lift bridge. If your boat has less than a 15-foot height, 18-foot beam, and 5-foot draft, you could venture into a 40-mile inland waterway with several locks that meanders through beautiful Mullett and Burt Lakes. With spectacular views of the majestic Straits of Mackinac, this island is perched at the top of where Lake Huron meets Lake Michigan. To find the harbor location of the island just follow the constant stream of ferry traffic from Mackinaw City and St. Ignace carrying day tourists and vacationers heading to the many resorts and B&Bs. The harbor is on the south end of the island in Haldimand Bay and is protected by two breakwaters with a wide-open entrance. As you approach the harbor you’ll see docks for several ferry lines to port with the Mackinac Island State Dock in the center of the harbor. This modern facility is at the foot of Marquette Park with a lush green lawn that leads into town. No cars are allowed on the island so everyone travels on foot, rents a bike, rides a horse, or is carried in a horse-drawn carriage. The main street is lined with specialty shops, a grocery store, restaurants, bars, and, of course, an amazing number of fudge shops, which is why tourists are affectionately called “Fudgies.” As you head into town you’ll see Fort Mackinac, where British and American troops volleyed for control on a prominent bluff surrounded by a stone rampart overlooking the straits. In our young country’s first land engagement of the War of 1812, the British captured the fort, and later returned it after the war. Stop at the Visitor’s Bureau and Information Center and pick up maps and brochures to get you started. You’ll find information on carriage tours, butterfly collections, museums, and sights of interest. Include a stop at the infamous Pink Pony Bar in the Chippewa Hotel, which has been a main watering hole for sailors for years. The Grand Hotel is another popular stop and golfers will find plenty of challenges there. If you need to provision go to Doud’s Market in the heart of town. The island is also served by an airport with several airport shuttle and taxi services so a crew change could be arranged. The island is the main attraction in this part of Lake Huron and on any summer afternoon it is as busy as a January night on Duval Street in Key West; be prepared for an overwhelming number of tourists. The trademark white stone breakwater lines the entrance to the harbor with the St. Ignace Municipal Marina conveniently located in the heart of town. The yacht harbor is easy to spot with a white-and-red-topped lighthouse on the southern jetty. Just beyond, the harbor entrance is marked by a red light on the northern breakwater and a green light on the shorter, southern breakwater. The marina has floating docks and full services. This well-protected waterfront is surrounded by a boardwalk and brick walkway on State Street, the main road through town. The park nearby welcomes dogs with a small sand and stone beach just for them. You’ll find another Doud’s Market for provisioning, along with a pharmacy, bookstore, hardware store, restaurants, and other essentials. Along the street banners and signs broadcast a variety of nightly live entertainment on the waterfront. Before the Mackinac Bridge was built connecting the Upper Peninsula to the mainland, St. Ignace relied on ferry service, but it also boasts a rich history in fishing and lumbering since its beginnings. About 20 miles northeast of St. Ignace is a unique archipelago of 36 islands. This area, while in sight of the hustle and bustle of Mackinac Island, remains a quiet backwater haven. Tucked between the islands are protected blue waters with cedar-lined shores and many summer homes perched on high, rocky bluffs. The shorelines of the Les Cheneaux Islands are lined with stands of cedar, maple, and poplar trees with the town of Cedarville tucked between Hessel and DeTour Village at the eastern end. A channel from Hessel to Cedarville cuts through Government Bay and a string of islands, some populated with summer homes, others more remote, offers snug anchorages. One of the more popular boats plowing these waters are old “woodies,” as the area is known for its vintage boats and boatyards specializing in classic and antique boat restoration. Many classic boat enthusiasts come to the area to learn the craft and have their boats restored here. Probably the easiest way to enter this island maze is at the eastern end. A half mile southeast of Penny Island is marker G1 that begins a well-marked channel leading to a great anchorage in Government Bay between La Salle Island, Island No. 8, and Penny Island. On your way in you’ll pass handsome homes with large boathouses, reminiscent of days gone by. At the north end of the Government Bay anchorage is a channel that leads to Cedarville, a boatbuilding haven tucked onto the shores of Michigan’s Upper Peninsula between Hessel and DeTour Village. The Cedarville Marina is in town, close to a library (with an Internet connection), and an easy bike ride to a grocery store up the road. Across the harbor is Tassier Boat Works and Viking Boat Harbor with marine services, and the home of the Great Lakes Boat Building School. Unless you have a draft over 6 1/2 feet or the lake levels are exceptionally low, you can continue west on the marked channel and wind your way through the islands past several attractive anchorages to Hessel. Otherwise, you can retrace your steps, travel around Marquette Island, and approach Hessel from the south. The west entrance, as it is called, begins at marker G1 northwest of Marquette Island, and continues north up the marked channel to Hessel. Known for its Antique Wooden Boat Show every August, this small waterfront village boasts the Hessel Marina and Mertaugh Boatworks (specializing in boat restoration), along with a small grocery store and restaurants. The Pickle Point shop is a special place for kids and adults, an idyllic counterpoint to the crowds of Mackinac Island. The museum, an old icehouse on the main road along the shoreline, offers an interesting look at the history of the area. About 30 miles northwest of Mackinac Island is the DeTour Reef Lighthouse that marks the entrance to the DeTour Passage. This is the northwestern head of Lake Huron and marks the mouth of the St. Mary’s River, which connects Lake Huron to Lake Superior. DeTour Village is a small fishing town located at the west end of DeTour Passage, the main freighter route leading to the St. Mary’s River. DeTour Village has a well-protected harbor with floating docks set behind a limestone breakwater. This is a popular stopover for cruisers going to and coming from the North Channel and it’s an ideal location for watching freighter traffic and the car ferry going to and from Drummond Island. It’s a hole-in-the-wall kind of town that’s quiet and peaceful with a nice supermarket for groceries, as well as small restaurants. East of DeTour Village is Drummond Island, which forms the other side of the DeTour Passage. Many cruising boats stop at Yacht Haven Marina when returning from the North Channel or Canada. 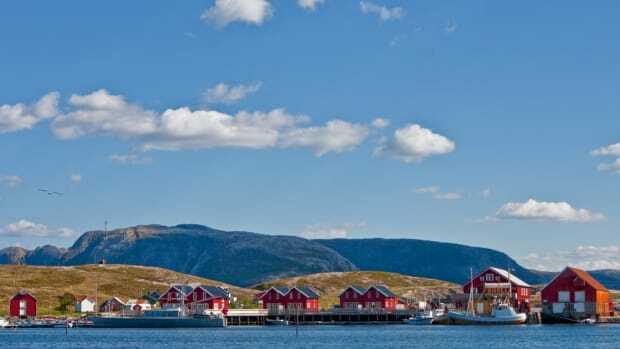 On the northwest coast the marina sits in a quiet spot nestled behind a series of small islands. The marina is about 8 miles northeast of DeTour Village. Coming from the village head northeast to pass R2 located off the west end of Drummond Island and swing east to G3 just south of Gull Island. From there on follow the red-green paired buoys to the channel leading to the marina, which offers a full range of services, including an Internet connection and an easy place to clear customs. Once ashore you’ll find cottages, campsites, beaches, golf courses, and plenty of restaurants to enjoy. This unique area is perfect for a summer cruise or as a place to stop off on your way to Georgian Bay and the North Channel. 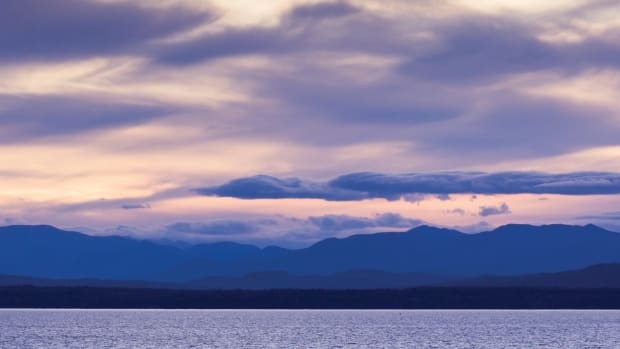 It fills the bill for anyone looking for a cruise that combines popular tourist attractions, small harbor-town ports, and secluded anchorages with stretches of sublime wilderness, rocky shorelines, and the crystal-clear waters of northern Lake Huron.